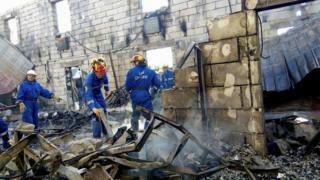 Seventeen people have died in a fire at a building housing elderly people in a village near Ukraine's capital Kiev. The fire broke out in the early hours of Sunday in a two-storey building housing some 35 people. "Emergency services units saved 18 people, five of whom have been hospitalised with burns of varying degrees of severity," Ukraine's emergencies ministry said. Police have detained the man in charge of the building. Officials said it was being used to house the elderly people illegally. Prime Minister Volodymyr Groisman described the fire as a "terrible tragedy that has caused irreparable loss" and said the government offered "sincere condolences" to the victims' families, Ukrainian media reported.